The Autism Society Philippines, two other national advocacy organizations and five learning institutions signed Memoranda of Understanding with Unilab Foundation, through Project Inclusion, last February 26 at the Bayanihan Center in Mandaluyong. The agreement cemented the group’s commitment to working together to achieve workplace inclusion for PWDs, especially for those with Autism and Down Syndrome. Rhodora Fresnedi, Unilab’s executive director, shared her vision for a world where businesses see the bottom-line benefit of employing individuals with disabilities. Fresnedi predicts that employment of individuals with developmental and learning disabilities will become a common industry practice. She also shared the rich set of projects that Unilab Foundation is investing in, dedicated to advocating for health for all Filipinos. Mona Magno-Veluz of the Autism Society Philippines spoke in behalf of the advocacy groups: ASP, Association for Adults with Autism and Down Syndrome Association of the Philippines. She shared her personal journey as a parent of a person with autism; and likened this to the direction of parent-driven advocacies. She opined that it is no longer enough to drive disability awareness and acceptance. 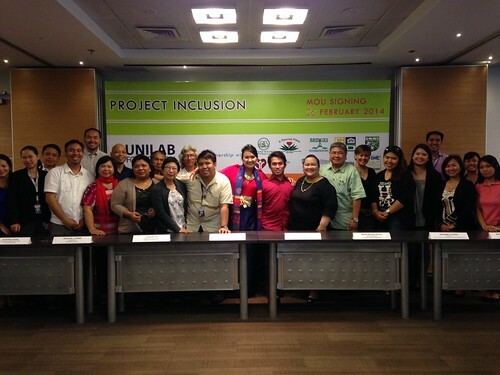 With the help of companies like Unilab, we can all together more actively champion inclusion. Prof. Archie David of ILLC took to the microphone to speak in behalf of several educational institutions: ILLC, Bridges Foundation, CARD, SHINE, One World School and The Learning Center. He regaled the group with stories of the successes of young adults they have mentored and placed in compassionate workplaces. He shared his hope that this “dreamlike” support from the business sector continues and amplifies in the years to come. Project Inclusion seeks to prove by way of an academic research approach that hiring PWDs, particularly those with autism and Down Syndrome will be beneficial to business. One of the project’s outputs will be a resource book for designing and development of appropriate assessment tools for employers and employees, with limited but usable skills, abilities and behaviors.